More visitors increase the profitability of the website. If the same number of visitors perform certain actions more often, profitability of your website could increase as well. An action (conversion) could be a purchase in your webshop, subscribing to your newsletter, filling in a contact form or downloading a brochure. 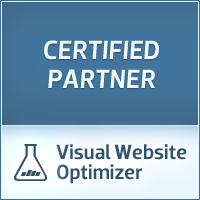 By increasing the conversions of the site, you improve the profitability of your website. Consequently the ROI (return on investment) of marketing efforts will increase as well. By optimizing your website, you will show that you understand your target audience and want to provide the best services in their interest.